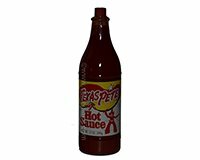 Famous Texas Pete Hot Sauce in a 12oz Bottle. Cut whole chicken wing sections at joints. Discard wing tips. Place the 24 to 30 pieces of chicken wings on absorbent paper to dry. To cook spread wings on a single layer of a sheet pan. Bake at 450° F for 35 minutes or until done. Melt the butter in a saucepan, and the Texas Pete hot sauce and stir well. Place the cooked chicken wings in a large bow.l. Pour over the sauce, and cover and mix well to coat. Serve use tons or slotted spoon to place wings on plate. Serve along with cut celetry and carrot sticks along with Blue Cheese Dressing. Ingredients: Made Of Peppers, Vinegar, Salt, Xanthan Gum (A Thickener) and Benzoate Of Soda (To Preserve Freshness and Flavor). Texas Pete® is a registered trademark of TW Garner Food Co. Winston Salem NC 27105.